If you were to turn to a dictionary and look up the definition of the words 'Comfort Food', you'd almost certainly find a picture of a nice piece of pie. And as the nights are drawing in, the days becoming cooler and comfort food is most certainly on the menu, I'm thrilled to offer this giveaway in conjunction with publishers Jacqui Small. 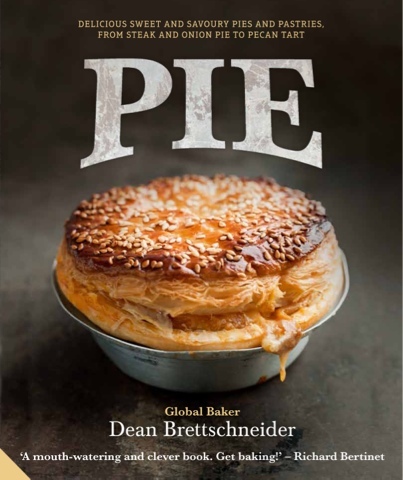 'PIE: Delicious Sweet and Savoury Pies and Pastries from Steak and Onion Pie to Pecan Tart' is written by award-winning Global baker Dean Brettschneider. More than eighty of the most irresistible pastry classics and modern creations from around the world come together in this mouth-watering tome. Chapters include meat, seafood, vegetarian and sweet pies, plus a chapter on ‘not-quite-a-pie’ - pastry treats such as flapjacks and sausage rolls. If you are unable to leave a comment, simply email me your answer and name (kate[at]whatkatebaked.com). Homemade lemon meringue pie - mmm mmm! Blackberry and apple pie - which means I love this time of year !! If we're talking savoury-chicken and leek is a good choice. However, my sweet pie of choice would always been a sticky Pecan pie! Just over the hills from where I live is a little village called Denby Dale who have over the last century made some of the largest pies in the world to celebrate many Royal occasions. Crowds of locals, young and old, have gathered together to share in the festivities and share a piece of pie. This is not only my favourite pie, but also Ian McMillan, the Yorkshire Poet Laureate's favourite pie; he even wrote a poem about it. Here are the words and even a rendition in the Yorkshire drizzle! Ugh....I like all pie *sigh* I love chicken and beef and mushroom, and sausage,rolls, and curry puffs, then there's pecan, strawberry and rhubarb, and banana caramel....oh dear. I like chicken pot pie but I also like a custard pie for a sweet pie. Mag: They are cute and lucky in twos. Ooooooh how can you pick a fav? You just can't beat a good pie, its as much the pastry as the filling don't you think. All of the pies mentioned above I could devour with relish, but probably a fish pie is the one I order when out as this is the one I tend not to cook at home. Or perhaps a lovey Pork Pie. That Denby Dale sounds good though. But a good Aussie party wouldn't be the same without a little party pie or how could you go to the football without ordering a Four & Twenty meat pie!What would life be without a pie. Cheese and onion...no, make that chicken and mushroom. Hang on, what about steak and kidney? Oh, I give up. I love pies! Love pie and my favourite generally depends on what I'm eating at the time, but if asked to choose, I would probably go for Homity Pie. Definitely chicken and mushroom pie!! Spanakopita (Greek spinach pie), crispy buttery filo pastry with creamy feta and spinach, transports me back to holidays in Greece and sunshine! Mince pies. Oh my god, I'm drooling at the thought and it's only September! I'm pretty good though, I refuse to make them until December (it seems wrong otherwise)... although then to be fair I devour so many that it sort of makes up for the other 11 months that I go without them! Mmm, you can't beat a fresh, warm mince pie drenched in icing sugar. Nom nom. Steak pie with sausages - pure comfort food!! Answer: Any! I grew up in a family that stood by the philosophy, "Give me bottom crust and top crust, with something in between." So excited about your new book! Congrats! Cherry. But I so rarely find one that's up to par. I love shortcrust pies with chicken, and vegetarian puff pies such as ricotta and artichoke or ricotta and spinach. It's hard to pick just one, really - a top three looks much better! That's such a hard question! I have to pick pumpkin pie, just because I can't wait for pumpkins to start showing up in the market so I can make one! Whatever the pie on the front cover is, that's my favourite. ;-) I love all pies but my favourite is probably my mum's apple pie (also known as Bero's), served hot with pouring cream. Crisp, light pastry and cooked with fresh apples with just a sprinkle of cinnamon and Demerara sugar before putting the pie lid on.